With the 4 Nations drawing to its conclusion, many a supporters focus will begin to drift toward the upcoming 2017 season with dreams of it finally being the Warriors year. With a new coach taking charge of the side brings new hope but will that hope turn into success or will it be another season of high expectations that slowly wither away and turn into despair and frustration for long suffering fans? To kick off proceedings, let's take a look at the 17 i predict to take the field come Round 1. With RTS returning from injury he will no doubt slip straight back into the #1 role. Although his return does open the opportunity to play either Fusitua or Lolohea at FB and shifting RTS to the wing. This may be an option but i would be very surprised to see Kearney making that call for RD 1. Ayshford holds his position at centre albeit to the disappointment of plenty of fans. For a large portion of the 2016 season, Ayshford was one of the best performers in the side and his dip in form at the back end of the season can be put down to a back injury he picked up coupled with the teams poor performances as a whole. Plenty of unfair and unwarranted criticism has been directed at him throughout the majority of the year which sadly seems to be the case for any player who lacks that so called "x-factor". What fans tend to overlook are aspects of Ayshfords game that don't make the highlight reels. Upon Ayshfords arrival at the club the defence of his centre partner improved out of sight. With all the natural blessings he possesses in attack, Kata showed signs of frailty with his defence during his rookie season yet managed to turn that around spectacularly during the off-season and over the course of 2016. One of the clubs fan favourites, Tuimoala Lolohea, played his best footy of the season while on the wing outside Ayshford. It wasn't just Tui that reaped the rewards of playing outside Ayshford, Fusitua was also the beneficiary of having an experienced campaigner on his inside. Fusitua has been known for his lapses in defense throughout his career but looked comfortable for the best part of his time on the field in 2016. It's no doubt that Ayshford instilled confidence in these two young players while also managing to allow them to stress less about what was happening on their inside and focus on their own game. Trusting your inside man on the edge is a crucial factor in forming a stiff line of defense, without trust players are dragged out of position feeling as if they need to lend a hand and this was almost non-existent with the Lolo/Ayshford and Fusi/Ayshford combinations. For an edge that was so fragile during the 2015 season, the inclusion of Ayshford certainly helped steady the ship in that regard. David Fusitua, Solomone Kata, Bodene Thompson and Simon Mannering are probably the only others who will demand automatic selection. The likes of Foran will no doubt be included without much thought pending NRL investigation and registration while big name players such as Johnson, Vatuvei, Luke, Matulino and Lillyman will certainly be added to the list of automatic selection for RD 1 despite coming off a disappointing season for their standards. Even with selection come RD 1, surely those players will be put on high alert for a drastic improvement with their performances because another season of under performing cannot be tolerated, especially with plenty of young talent nipping at their heels. 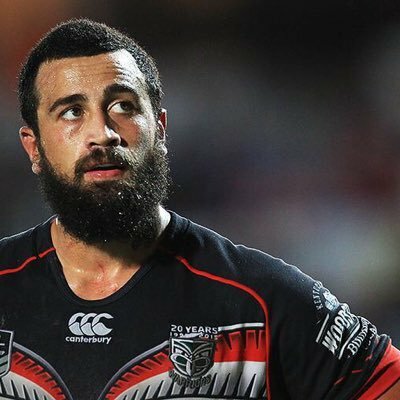 Ben Matulino - Since 2011 there has been 6 Warriors' Player of the Year awards handed out, to two players - Simon Mannering with 4 (2011, 2013, 2014, 2016) and Ben Matulino with 2 (2012, 2015). By the time 2017 kicks off, Ben will be 28, an age which is highly regarded as when props begin to play their best footy. With 2 of the clubs most prestigious awards already under his belt, nearing 200 First Grade Games and with experts in the game calling him one of, if not the best prop in the competition at different times over the course of his career, it's time for Ben Matulino to stand up and make his presence felt. A successful Warriors season is heavily reliant on Matulino becoming the enforcer in the pack and although 2016 might be a season both himself and fans would rather forget i believe it'll serve as motivation for the upcoming year and we'll see a ferocious Matulino leading the Warriors pack. Albert Vete - Apart from an off-field error in judgment on Prince Alberts behalf earlier in the season there is plenty to like about this bloke. While still in the early days of his career and with plenty of footy left for him in the future the signs are already there that Vete has plenty of what it takes to propel him to the top of the NRL props pecking order. It's not just the things he does on a footy field for all to see and ultimately end up being recorded as stats, it's the stuff you notice off the ball. On numerous occasions already over Vetes career i've witnessed him show determination and pride no matter how glum the current scenario may be. There have been games that were toward the back end of the 2nd half with no hope of coming away with a victory and with plenty of his team mates already with their minds in the showers and Vete has just kept on ripping in regardless of the situation. Between himself and Matulino we may very well see 2 of the comps form props in Warriors colours for 2017. Roger Tuivasa-Sheck - RTS will no doubt be itching to get back onto the field after a long lay off with injury. With this man in peak form and fitness the Warriors all of a sudden become a much more dangerous outfit. Sitting on the sidelines watching powerlessly as the Warriors season unraveled in 2016 will no doubt serve as extra incentive for RTS to make a mark at his new home at Mt Smart. Ata Hingano - Plenty of talk has surrounded Tui and his prospects as the long term option at 5/8 for the Warriors but i believe this is the future right here. If you don't catch many of the lower grade games then chances are you haven't seen much of this young bloke, but with his limited opportunities in 1st Grade during 2016 he looked to have plenty of class and composure. In those limited minutes Hingano played in the top team he looked to do plenty more at 5/8 than the popular alternative. Should injuries strike this season look for this bloke to light up the field and become a familiar name within Rugby League loving households. Bunty Afoa - With prop being his position of choice i think Bunty will eventually find a home in the 2nd row. Currently the starting back row combination of the Warriors are more or less locked in but one must wonder, if Hoffman didn't have the C next to his name, how safe would his position be? And if his position isn't safe with without the C, do we have the right captain? Should any of the starting back row become unavailable then Bunty will slot straight in and offer a bit more youthful energy with a sharper edge to his attack than the current crop. A star of the future no doubt and will likely play plenty of 1st Grade next season. Charnze Nicholl-Klokstad - I personally believe Charnze was unlucky not to get any game time in first grade last season. He is a genuine utility player who can fill in anywhere in the backline and with a big off-season in front of a new coach he may well be a bolter for the utility position on the bench. Failing that, he surely gets the nod should injuries strike over the course of the year instead of languishing in reserves. Manu Vatuvei - While there is no denying this man has done plenty of brilliant things for club and country over the years, the unfortunate truth of the matter is that successful teams do not select players based on what they did 2,3 or 4 seasons ago, they select players worthy of selection right now! With an increasing amount of time being in the papers for the wrong reasons, fans have every reason to feel let down by a man who is old enough and experienced enough to know much better. With injuries seemingly creeping into his game, handling skills that leave you on edge every time the ball is near him, his ability to turn slower than milk and the one thing that leveled all those negative aspects of his game out, tries, or lack thereof. There comes a time in professional sport when the best of them lose that edge and start to be shown up by younger blokes and that seems to be Manus time right now. Let's hope 2016 was just one of those years for him and he bounces back to The Beast we all know and love, unfortunately i cannot see that happening. And NO!!! Moving him into the forwards IS NOT THE ANSWER!!!! Shaun Johnson - Arguably the most naturally gifted footy player currently in the NRL. There are things SJ can do on a field that no other player would even attempt and those freakish abilities have managed to get us out of trouble on plenty of occasions. The problem is, they are too few and far between. It's hard to believe that after 6 seasons in First Grade he's shown very little improvement in his ability to control a game. The frustrating thing is he'll show glimpes of it, a game here, a game there, 10 mins here, 20 mins there. Just like the rest of his game, inconsistent. Plenty argue that he is not a "controlling half" yet he shows glimpes of his ability to do exactly that. Plenty argue he is just a "running half" yet we see that as regularly as we see his ability to control a game. If SJ cannot control a game then why are so many fans screaming for Lolohea to play 5/8? Are you kidding? If Foran does indeed get the green light to play in 2017 and takes over as the controlling half and we see more of the same from SJ, what's the excuse then? "Oh Foran gets too much ball now, let SJ control the game sometimes". Excuses are running out, as is patience and SJ needs to fire in 2017. His price tag is far too high for such inconsistency. I hope more than anything SJ tears the comp apart consistently next season. But has he got that in him? Or will the outside noise continue to be his major downfall. Jacob Lillyman - It's been an all to familiar tale with Jacob over the last few seasons, play great leading into Origin, gets selected for Origin, plays great for QLD, hits cruise control for the remainder of the year. Jacob is such an important cog to the Warriors machine and with him sitting in idle for such large portions of the season it puts far too much strain on the rest of the pack, not to mention teaching bad habits to a crop of very promising young forwards currently within the ranks. First 6 and last 8 games - Since we last made the finals in 2011, our biggest Achilles heel has been the teams inability to start and finish the season off strongly. The first 6 games of the season are important to launch that springboard to set yourself up for the remainder of the season while the back end of the year is crucial to finding the form required to head into the finals. Of the 30 games we have played in the opening 6 rounds of the comp since 2011 we've managed to win only 9 of those. Turning our attention to the back end of the season and the final 8 games we've managed to win only 9 from a possible 40. From those 70 games we've won a total of 18 and lost 52 and if we break that down to a season average of points we're earning during those rounds it's a woeful 7 points from 14 games a year. Add the two byes into that equation and it takes us up to 11 from 16 games/rounds leaving only 10 rounds to compile the extra 17 points required to make the "magic number" of 28. An improvement in these areas is an absolute must for as long as we struggle at the start and back end of the season, we won't see much success. Higher energy levels to begin game and 2nd half - I sometimes sit in utter disbelief as i watch the side run out for the kick off to either start the game or begin the 2nd half then witness a horror show unfolding in front of my very eyes. How one side can so often come out looking as flat as they do on such a regular basis beggars belief. I don't know what the ritual involves prior to kick off but whatever it is, stop it! Stop it NOW! The occasional game you can understand but this happens on a far too regular basis at a professional level and it quite frankly isn't good enough. Stiffening up defence - Communication. Commitment. Trust. Pride. Attitude. It's not all just about getting the individuals tackling technique perfected because without those 5 ingredients i mentioned the teams defense will continue to be in disarray. Far too much jersey grabbing and lazy attempts at a tackle from professionals. Far too many players walking back to the defensive line. WALKING! That's just not good enough? If you're hurting and sucking in the big ones while not being able to get back and defend with your team mates then stop taking the easy way out and move those legs faster and prepare to hurt more because winning a comp involves individuals pushing themselves through that barrier and digging deeper than they knew possible. A jog would even show intent and put the fans minds at ease in regards to players commitment to the jersey but walking shows disrespect to yourself, team mates, coaches, club, fans and sponsors. We can't win comps when only the bottom couple of teams have more scored against them than us. Minimising errors - I would love to see stats on errors from teams in their own 20m and penalties being given away in the opposition 20m. I would almost put the video game collection on the fact we must be miles ahead of 2nd place. The pressure we put ourselves under is astronomical compared to any other teams i watch over the course of a season. If we fix those unforced, brain snap type errors we'll go along way to winning more games. Failing that, defend the set following the turn over in possession or penalty being given away. It's like being able to read the future in these scenarios, Warriors error, opposition try. The sad thing is, it's more often than not all too easy for the opposition to stroll over. Rarely do we make sides work for their points. We are guilty of letting in some of the softest tries you're likely to see during a season. Faither - "by the fans, for the fans"